Light, well-drained soil is best. Avoid wet, heavy clays. Divide occasionally to prevent drying out in center. A good means of increase. Color is best in full sun. This one of the few ornamental grasses that is reliably hardy in Minnesota. 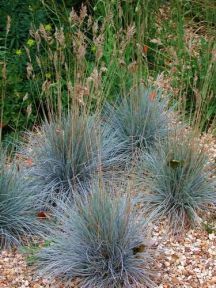 It forms tufts of finely-textured, silvery-blue foliage. It grows from 6 to 12 inches high in neat mounds. Although most reference books claim that it is drought tolerant and will take a baking sun, I have found that under very hot, dry conditions the tips tend to brown. It appears to take a part sun to light shade quite well. Some books recommend removing the seed stalks but I find them to be very attractive. Plants should be divided every three years or so. More frequent division may be needed in rich, moist soils. Dying out of the plant center is a signal that division is needed. Fescue is very attractive along walkways, in rock gardens, or as an accent in the front of the border.